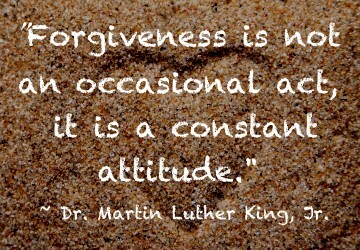 In the last post we looked at forgiveness as a ‘fruit’ of the Holy Spirit that demonstrates we are a genuine Christian. If the Holy Spirit dwells in us (i.e. we are a Christian) then He will transform us into people of forgiveness, who will forgive others when they wrong us, in the same way that God forgives us. Clearly Christians must be people of forgiveness, but what exactly is biblical forgiveness? Jesus often described sin and forgiveness as a debt (e.g. Matt 6:12; 18:21-35), because when we are seriously wronged, our natural inclination is to view the person who wronged us as owing us something. Their wrongdoing creates a sense of obligation, a liability, a debt, and we feel a compulsion to make that person pay this debt. We might consider the debt cancelled when we have hurt them back, yelled at them, made them feel bad, or seen something bad happen to them. We reason that when they suffer in a similar (or usually greater) way than we did, then the debt will be paid, and the obligation gone. This is natural human tendency. Biblical forgiveness however, is to give up this right we think we have to seek retribution against a person who harms us, and as such, biblical forgiveness is a form of voluntary Christian suffering. Consider this example. If a friend borrows my laptop computer, and breaks it when it accidently falls out of his bag while he is riding his bike – a debt is incurred. If the computer costs $400 to fix, then breaking the computer has incurred a debt of $400. If my friend fixes the computer, then I get my computer back but it has cost him. If on the other hand I forgive him, the debt doesn’t simply vanish, but I absorb the cost of the debt instead – either I will pay the $400 to fix it, or I will lose the use of my computer. Biblical forgiveness then is to cancel a debt by paying or absorbing it ourself. Someone must always pay the debt, and when we forgive, that someone is us. Whenever someone sins against us we lose something, it might be an opportunity, a relationship, our happiness, our peace, our property, our reputation, etc. We then have two choices; we can seek retribution by pay­ing the person back in a similar or greater way, or we can choose to forgive them and refuse to pay them back by absorbing the loss or damage ourself. Either way, there is a debt and it cannot be dealt with without suffering – either we make the perpetrator suffer, or we forgive and suffer for it ourself. Biblical forgiveness then is costly, and emotionally expensive. We refuse to do anything to hurt the person; we refuse vengeance, payback, or inflicting pain on them in any way. We refuse to dwell on past incidents of wrongdoing by replaying them in our imagination (this only keeps us hostile toward them by keeping the hurt and loss fresh). We refuse to play detective by making assumptions about their actions, and we refuse to vilify, or demonise the offender in our mind. We commit to pray positively for their growth, and seek over time to restore and rebuild the broken relationship. Biblical forgiveness then is not easy, it is difficult and painful, it involves us suffering as we bear the cost of someone else’s sin. This means that it is likely that biblical forgiveness is something that we grant before it is something we feel. Contrary to popular opinion, we are never justified in denying forgiveness based on our emotions; instead the Bible tells us it is sinful to be driven or controlled by improper emotions. So we must always do what is right, even when our emotions disagree, because when we are obedient to God regardless of how we feel, wrong emotions are starved and eventually replaced with right feelings. If we are children of God then, despite the suffering involved, we will forgive for the sake of Christ, because we love Him above all – because our love for Him is greater than our desire for retribution, or for anything else. Most importantly however, as we bear the cost of forgiveness for another person, we are following in the footsteps of our Lord and Saviour (1Pet 2:21; Matt 18:21-35; Col 3:12-15) and this provides evidence that the Holy Spirit is transforming us. People often ask, “Why did Jesus have to die? Couldn’t God just forgive us?” In reality though, no one who is sinned against ‘just forgives!’ There is no such option, either the offender must pay the cost, or the offender is forgiven and the offended one pays. There is never forgiveness without suffering, and this of course points to our marvellous Saviour who on the cross innocently and willingly suffered beyond description in order to forgive us. When we receive this forgiveness from God we also receive His Holy Spirit who empowers us to obey His command, and forgive others in this same way. And when people see us doing this it points them to God and He is glorified (Matt 5:16).